I'm going to call tomorrow to book the test. It does eat oil. Probably close to the 1qt/1000 miles. Does anyone think having Rv6 j-pipe and HFPC's will be an issue? Last edited by dopeboy1; 12-06-2018 at 08:54 PM. It shouldn’t. A free flowing exhaust has little impact on what actually happens within the engine itself. I’ve heard of dealers try greasy tricks to deny warranty work in the past, but, this would be a whole new level. The oil consumption issue is well documented for the 4G and I’ve yet to see anywhere, in my last 15+ years of being into cars, hearing that exhaust mods caused oil consumption. I've suspected ring carbon buildup was the main cause in oil burning. Many Honda engines have this issue, not just the 3.7L alum liner. I started to experience oil burning several years ago but stopped it with cleaning products. I checked my oil level two days ago and it hasn't moved even after 4,900 miles. Wow I hope this applies to owners in the US. Mine has 140k and burns enough to be annoying. What cleaning products did you use? im pretty sure ive read that it does. It was questionable whether or not it would extend into Canada. Im impressed that they would send a letter to every 3.7 owner. Gives me more faith in Acura. Anyone in the US receive anything like this yet? I just called my local Acura dealer. The service advisor said that I had to pay for the initial oil change (whatever rate) and "an inspection" at $135 an hour. Did you also have to pay for the inspection OP? Also, the dealer said i had to pay for any oil consumed when i go back for the checks. Ie, any oil they have to add back in. Can anybody else check this info when they go please? I want to make sure the dealers aren't trying to get a quick buck in. I haven't brought it in yet. I'm doing it next Monday. But the service advisor said I have to pay for the oil change and that's it. No mention of any other charges. Did they say what the inspection is for like is it when you get the oil change done or after you bring it back every 2000 km? They said it's the initial diagnostic fee. Well that does sound a little odd. The simple fact is though that some dealerships are better than others. I know the dealership Im using has always been really good and haven't tried to nickel and dime me (ive only been there twice but one of the service advisors is someone I went to highschool with). I won't really know anything more until I take it in next Monday. But ill be sure to ask many questions. Again the guy I talked to specifically said I will only pay for the oil change. If I were you I would contact Acura Canada client services 1-800-9ACURA9. See what they say the procedure is. Okay I was curious so I just got off the phone with another service adviser and he said mostly the same thing. The ONLY thing I will pay for is an oil change ($79,95), he said an inspection is INCLUDED in the 79.95 price of the oil change. Then I will bring the car back ANYTIME the oil level is low regardless of mileage. He said they will measure the oil consumption and top it up with oil FREE of charge. So I will only be paying 79.95 for the entire process. He said that 1 liter of oil consumption in 1500 km is an automatic fail which will result in repair. He said that 1 liter of oil consumption for anywhere between 1500 km and 4500 km, they will send the paperwork to acura canada (along with oil change records) and corporate will decide if they will repair it. I forgot to ask about how long the process goes on for. Nice everyone kept posting your results!! I called 2 other dealers, and neither of them mentioned a $135/hr diagnostic fee, nor payment for oil that's added in after the initial change if it's burning. So just be aware if your dealer says these charges are normal. should not be a fee. I just did the test and just paid for the oil change. Nothing else. Do you guys know if the new replacement engines fix the oil consumption permanently? So I've already gone through this entire process 2 years ago, failed the oil consumption test, and got a new short block replacement on Acura's dime at 95,000 miles. Correct, you go to the dealership and tell them you want to start an oil consumption test which starts with a normal oil change paid out of your pocket. My dealership had me come back to the service bay every 1000 miles to have the techs check the oil level. If it was low, the dealership topped it off free of charge. After 5000-6000 miles (5-6 return visits), it was officially documented that I was losing 1 quart every 930 miles, and the service manager agreed that it was bad enough to get corporate involved for inspection. That's where the $135/hr (or whatever their hourly rate is) came to play. In order to figure out the root cause of the burning, I had to agree to 7 hours of labor to tear down the engine while someone from corporate came to inspect the damage. If corporate agreed that a factory defect caused the problem, they'd order a short block replacement (no new heads, bottom end assembly only) and I wouldn't pay anything out of pocket. If it was somehow determined that I was at fault or something, then I'd be on the hook for the teardown and re-assembly of the original parts. I didn't pay anything out of pocket at that original meeting with the service advisor and service manager, I just had to sign the service agreement so they could start the work. Timeline wise, I started the oil consumption test on Dec 23, 2015 and 5000-6000 miles later, I dropped the car off to them to start work on Apr 1, 2016. Within a few weeks, I'd spoken to the service manager who told me about corporate approving my warranty short block replacement, so the OK came about 4-5 months after I started the process. Due to parts being back ordered and waiting for the recalled Takata airbag replacement to come in, I didn't get my car back until July 1, 2016. So I had 2 TLX and 1 MDX loaners for 3 months. From what I've read, nothing was ever re-engineered from Acura to change anything, so they're just putting in new engine blocks with potentially the same flaws as far as I know. However, I've put an additional 45,000 miles on the new block, and don't see any signs of serious oil consumption. It's not perfect, but still significantly less than 1 qt between standard 6500-7500 mile oil changes with Mobil 1 5-20 synthetic (I change it based on the MID recommendation). So you don't need to go back every 1000km? My friend also sent me this after hearing about my extension. I was told I can come back whenever I want but it makes the most sense to only go back when there is a little oil on the dipstick which would represent it being down about 1 liter. Interesting article... I'm not really cheap enough to complain about the oil change fee. I mean of course Acura wants to monitor the burning over the full course of a fresh oil change and how else would they know it was done properly with correct oil if they don't change it themselves. Finally you will have to pay for oil changes regardless, unless you do them yourself I guess. Not a big deal to me. Oh and one last thing, I defiantly think they overfilled my oil. Not too sure what to do about that though. Acura redesigned the piston rings so they will not clog with carbon deposits. The piston rings are the issue; part numbers have changed compared to what they were from the factory! 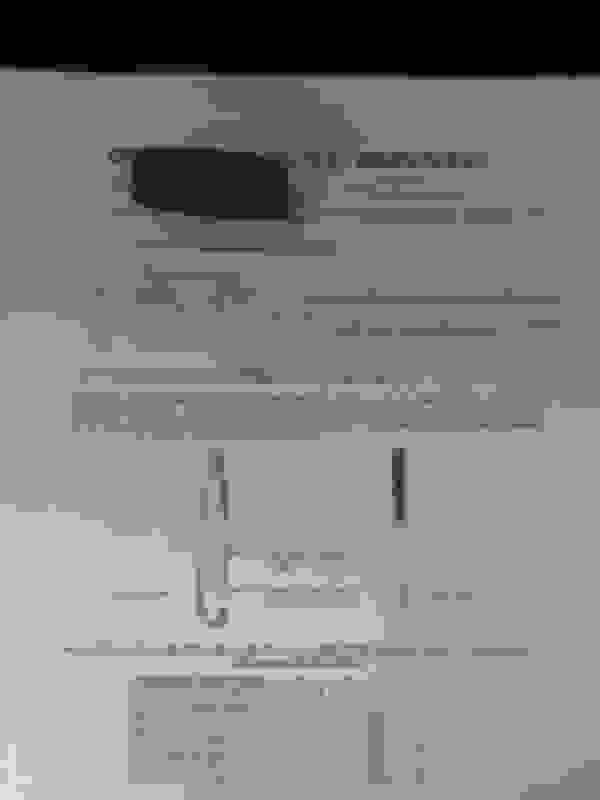 I got the same letter. I brought in my car to do the oil consumption test. So basicly I paid the 79.99 for the oil change. They told me to go back every 20% decrease on the oil life % to get it checked. If they need to top up, I would pay for the top up. Tell Acura to take your J37a4 and stroke it out. Make it into a TL Stroker. Did anyone end up getting the piston rings replaced for free ? Many people have under the original warranty. But probably not under this extension because the testing process takes some time. Im going to take my car back to the dealership soon for the oil top up and recording. At this time I am optimistic that mine will be replaced. 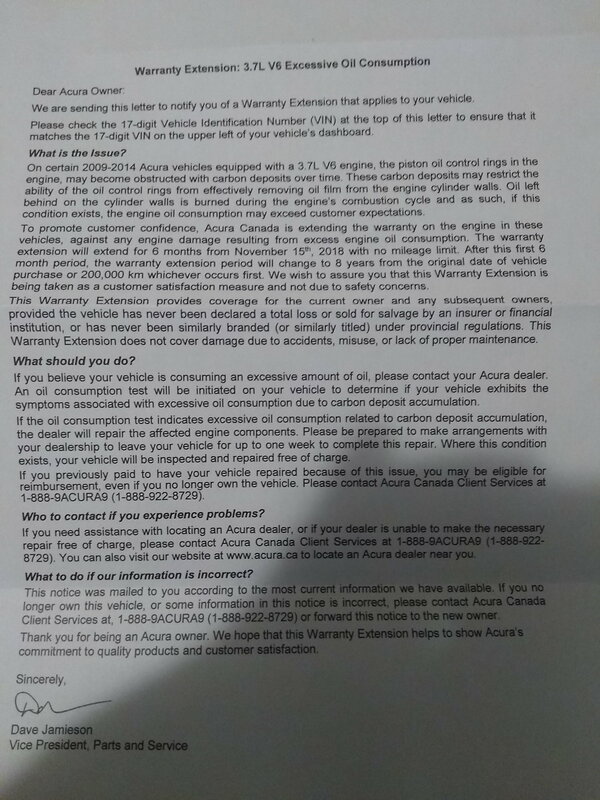 I too received the letter, and although my oil has typically been fine, I checked it a week or so ago when changing my battery (a couple weeks of minus 30 C takes its toll), and noticed it seems low. Called my Acura dealer, and they suggested I come in as soon as possible and start the process. Instead, I'll go to another dealer, since the one I like using is at the other end of town. For something like this, going to the nearest (though "weaker") dealer makes more sense, though my question is, if they determine that I have a problem, do I then have to let the (weak) dealer who ran the test do the work, or can I bring it to the stronger dealer (without having to re-run the test). Unfortunately, I also noticed spotting in my driveway over the last few days, so I suspect there's now also an oil leak, which I'll have to attend to before starting the test. If I don't, that will be the first thing they identify, and I'm not paying a dealer to look at an oil leak. So, in a few minutes, I get to take my car to my mechanic, to get him to fix an oil leak, so that I can then take it in to run a consumption test. Hondas/Acuras may be reliable, but when things start to go, they ain't cheap. Brought it in for the first top up today and it was down by a litre after driving 1499.9 km. Coincidentally they did say 1 litre burnt in 1500 km or less would be an automatic fix. 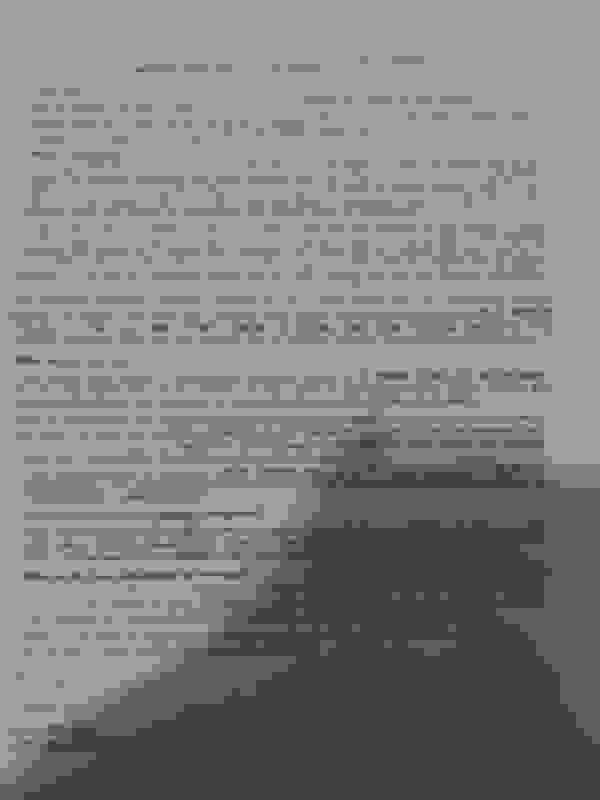 I made sure to get a copy of the work sheet. I didn't get that sheet. I went in to start the test last week. They just said to bring it in at 1000-1300 km. They should have given you the sheet; it's part of the "program". They likely kept both copies on file. I'd ask. I had mine started today. 3 hours for an oil change! In fairness, I had them bump it from the oil change ($99) to the mechanical inspection ($120, but reduced to $110 when I paid), as I wanted to have them look at the alignment. And, also to be fair, I was 15 minutes late for the appointment, so they may have snuck someone ahead of me. But 3 hours! Thinking it was a 30 minute thing, I chose to wait, but in retrospect should have jumped on their shuttle. Oddly, I find myself hoping that I'm burning oil, if for no other reason than to justify the loss of a morning. You have to ask for it. But it means nothing until you bring it in for a top up and the numbers are recorded. You must have got paperwork for the oil change/inspection which will have the mileage recorded. So ask for it when you get it toped up. Last edited by dopeboy1; 02-19-2019 at 02:16 PM. I was instructed to check oil and it if hits the lower mark, go and visit them to fill it backup. just got mine in the mail today! 211k miles and repairing the bottom end of the motor or getting a new one sounds great to me! 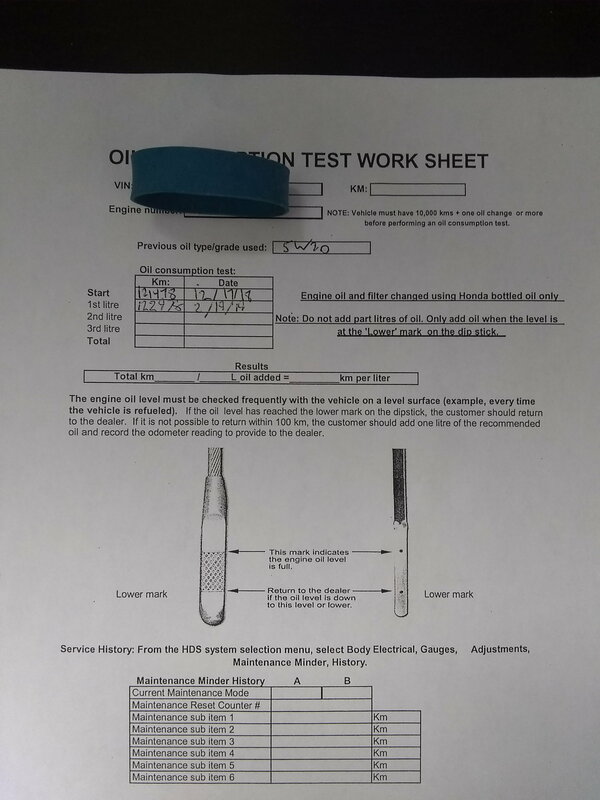 Yeah, i have the service work order and it states "oil consumption test" on it. I suspect the service advisors aren't all trained the same way. Mine told me i didn't need to check my oil level at all. I recieved my letter yesterday as well. First, there are 2 different J37’s. The 07-09 MDX uses the J37 with the RKE block which doesn’t have oil consumption issues. The oil guzzling J37 use the RK2 blocks of which have different (defective by design) oil ring packs. The 10-13 MDX, 09-14 TL SH-AWD, ZDX and 3.7 RL’s all used the RK2 blocks. Before you go to start your consumption test, MAKE SURE you don’t have any oil leaks. You ARE NOT required to present oil change records and after they do your oil change, check the oil level BEFORE leaving the dealer as I’ve heard many reports of dealer over filling vehicles so it would appear they would potentially pass the test and be declined warranty work. Just got my oil changed in order that the consumption test and it was above the fill line by about 3MM. It is about the same when i put in 5QT. Either way it will be down to the low line in 1k miles in my car.